Over the past six months, EMI has monitored new credit card launches by leading issuers and identified 10 trends. Issuers are moving away from long-duration introductory rates on purchases and balance transfers (BTs), in particular on travel cards. A basic earn rate of more than 1% (or 1 mile/point per dollar) is common. Most cards are offering a higher earn rate for spending in specific categories. Bonus-earn categories tend to target travel, dining, gas station and supermarket spending. U.S. Bank Altitude Reserve Visa Infinite offers three points per dollar on mobile wallet spending. Issuers are not competing aggressively on APR. None of the cards had an APR below 10%; the lowest was the Navy FCU More Rewards American Express Card, with an APR range of 10.65%-18%. The two affluent cards with annual fees of $400+ (UBS Visa Infinite and U.S. Bank Altitude Reserve Visa Infinite) have a single APR. The two new affluent cards are metal. Three premium cards (with annual fees) all offered 50,000 bonus points. Three other cards (with no annual fees) promoted bonus offers of 10,000 miles or $100. American Express launched Blue Delta SkyMiles. For higher-end cards with annual fees, the robust travel benefits are emphasized over the rewards program as the core justification for the fees. No foreign transaction (FT) fees on travel cards is now becoming a standard feature. 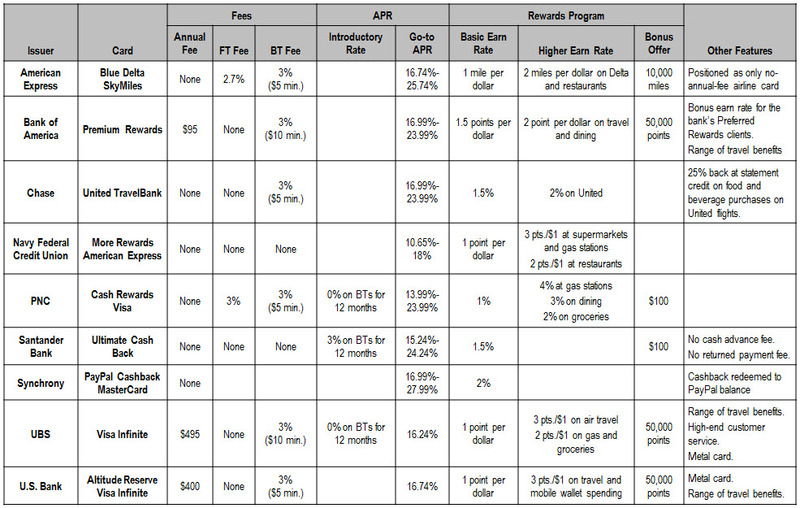 American Express remains an outlier, by continuing to apply a 2.7% FT fee on its travel cards. Most issuers continue to apply BT fees. However, Santander Bank’s Ultimate Cash Card is positioned as having no fees in multiple fee categories (annual, BT, cash advance, FT and returned payment). This entry was posted in Credit card and tagged American Express, chase, credit card fees, Navy Federal Credit Union, Santander Bank, U.S. Bank by mronan. Bookmark the permalink.